All of the printable invitations templates available on this page are for those who feel like they have been stopped short when it comes to getting the actual wording on the page while creating their homemade invites. It's just plain easier to use a template! These templates are completely blank and made to use for printing text only. Use them in conjunction with any of the tutorials for homemade and handmade invitations available here at Do-it-yourself-invitations.com. Below I am providing templates to help you easily set up text to print either either flat 5 x 7 invitations in both landscape and portrait, as well as templates to create simple folded cards for invitations and thank you notes. A super easy solution to your handmade invitations! These free printable invitations templates come in the form of an interactive PDF file. The file is available for immediate download and can be used to make as many invitations as you please. 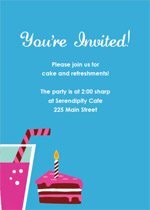 How To Use These Interactive Templates - To personalize the printable invitations, simply download and save the file you wish to use to your computer desktop. Open the PDF file using a PDF reader (latest version of Adobe is recommendable). Choose the arrow/cursor tool from the tool palette at the top of the page. Simply click on the white part of the page where you will place your text and begin typing. It's that easy! After you have your invitation wording typed onto the PDF page, you can then use the type tool palette to change the fonts, font sizes and colors, alignment, and more. Simply highlight the text with your cursor tool and then press the "control" and letter "E" keys at the same time to pop up the tool palette. BTW - These invitation templates are BLANK for you to use as you wish! The pictures below are only to illustrate the orientation of the card/template. 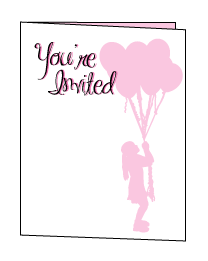 This invitation template will create a standard folded card sized at a 5 1/2" by 4 1/4". 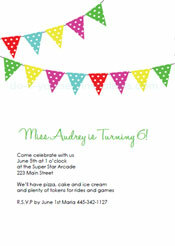 Great for making simple invitations for kids parties and casual parties, as well as thank you cards. Get creative with snazzy fonts, or add your own graphics and images with stickers or rubber stamps. This printable template will create a folded card which opens from top to bottom. I like to use these for adding more of a whimsical nature to my cards and invitations. simply add your invitation wording or text to the template, print it out, and then cut the paper in half the long way. 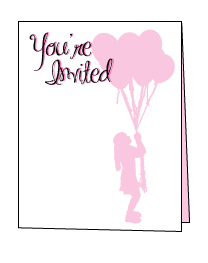 The next two invitation templates are for making flat traditional invitations sized at 5" by 7", which is good for finding envelopes to go with them. It's a very standard size. These templates work inexactly the same manner as above. There are helpful cutting guides on each template to aid in trimming the paper to the correct size while keeping the text centered. If you are thinking about making invitations using rubber stamps, or rub-ons, or something of that nature to apply an image, then these templates will be absolutely perfect! They are also great for printing onto vellum in which to trim later and pair with some decorative paper. If you are looking for something a little more simple, a little more basic, the below templates are strictly printable. You must cut and attach them to the inside of a card/invitation and fill in the details by hand. They can also be used to create folded cards such as the templates above. Very simple and easy to use, all you have to do is add some creative art work, stickers, or other crafty embellishments, and then fill in the details with your own hand writing. A template for making very artsy craftsy invitations. They also make a great kids craft project! You will need Adobe Reader (the latest version is recommendable) installed on your computer in order to open and read any of these files. You can get Adobe Reader here. (a new window will open so you can download without leaving this page).